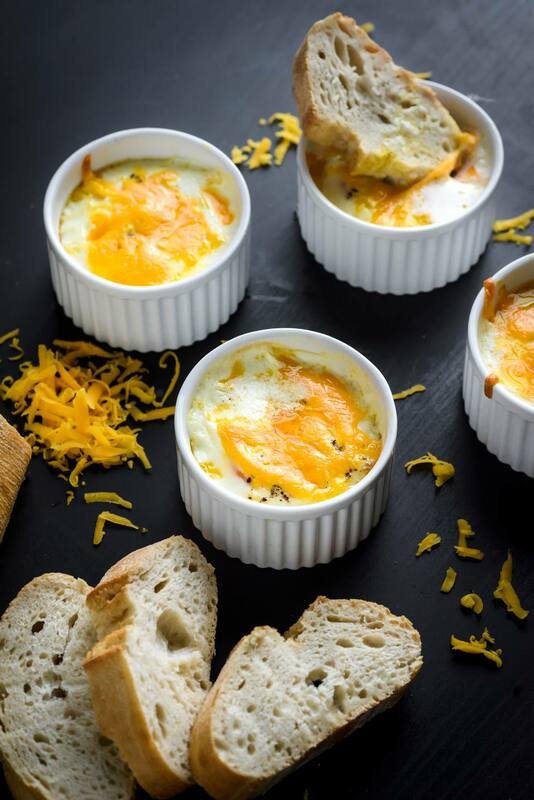 These easy shirred eggs are baked in individual dishes with cream, butter, and cheddar cheese. The eggs make a simple breakfast with 2 eggs per person. Add bacon, ham, or sausage, if you like, or serve them with fresh sliced tomatoes or fruit. They are excellent with a side dish of baked beans! Put 1 teaspoon of melted butter in each of four individual baking dishes or ramekins. Brush the butter over the bottoms and sides of the dishes. Break 2 eggs into each dish. Add 2 tablespoons of heavy cream to each dish and then sprinkle with salt and pepper. Sprinkle 1 tablespoon of shredded cheese over each egg just a minute or two before​ the dish is done.